There are over 500 species of feathered friends fluttering about the Greater Kruger, just waiting to be observed and photographed. Seasonal migrants, endangered species, waders, raptors and passerines all form part of the plethora of birdlife found in the iconic Kruger region. Birders flock (pun intended) to the Kruger to find those lifers and rare birds; ticking off species when they return to camp from game drive. Spotting big game is, undoubtedly, an exciting and enthralling experience, but there really is nothing better than birdwatching. If you’re going on a Kruger birding safari, you probably have a few birds on your personal list that you’d identify and a few calls you’re dying to hear live and not from your tinny sounding app. Birder, twitcher or budding ornithologist, there’s plenty to keep your bird brain (joke) occupied! One of our favourite family of bird is the eagle, of which there are many species. The Martial eagle is Africa’s largest eagle and boasts a wingspan of a whopping 2.6 m from tip-to-tip. This majestic raptor is the shy silent type, but its power should not be underestimated. The Martial exudes strength and agility, and feeds mainly on medium sized prey such as reptiles, other birds and small mammals. This raptor spends most of its day sourcing prey – it sits silently in trees earmarking its next target, or takes to the skies to identify terrestrial prey. Once targeted, the eagle uses the element of surprise to attack. 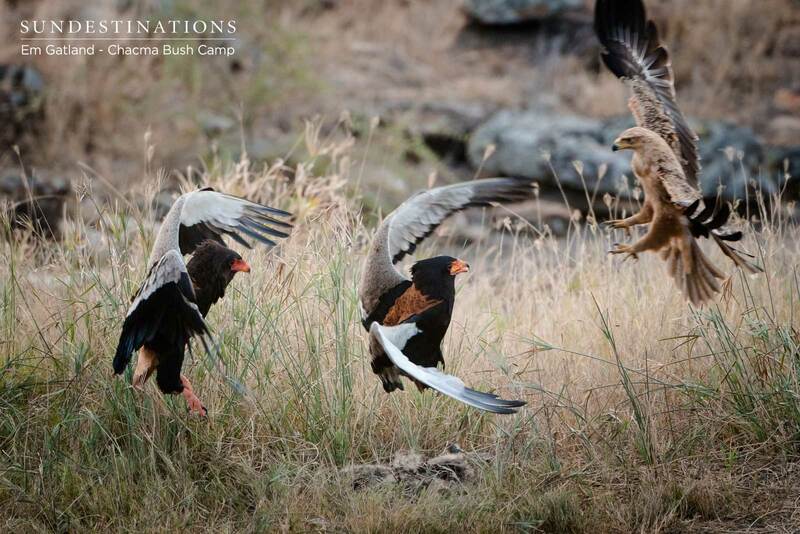 The Martial eagle swoops down at such speed, and ambushes its prey. It uses its massive wingspan to angle its body in the direction it needs to go. The bare leadwood trees appear to be a favourite place for these birds to roost, and they build nests some 60 feet off the ground. The next time you see a hefty nest straddling a leadwood, or on the steep cliff faces, look out for a Martial eagle. You’ll identify the bird of prey by its markings of a white underbelly and brownish upper parts. You may even hear its call, which sounds like an excited whistle. 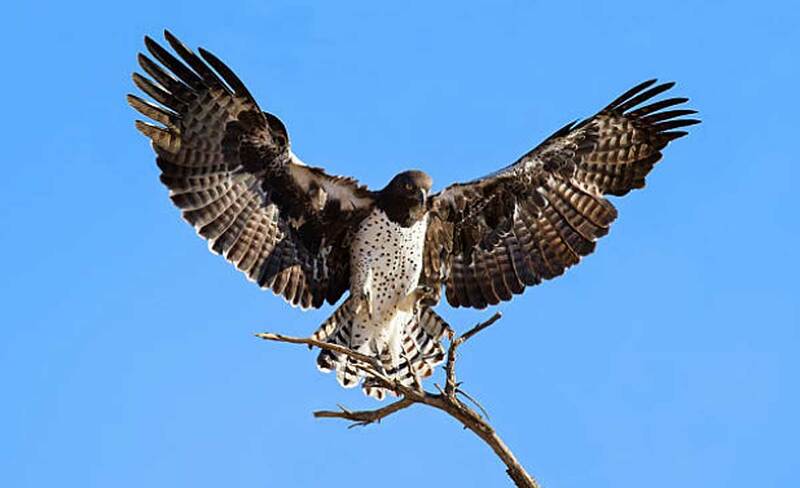 The Martial eagle is a large, looming and rather regal raptor – a definite awe-inspiring birding sighting in the Kruger. 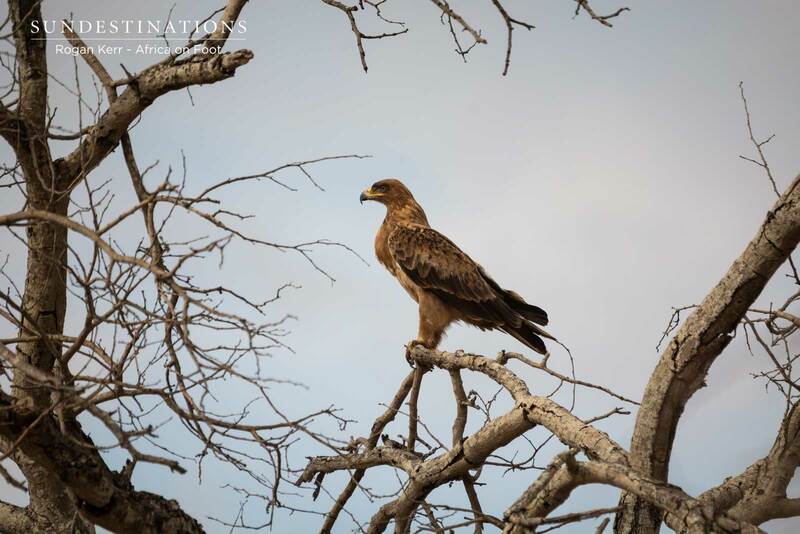 The tawny eagle is another large, solitary eagle commonly spotted in the Kruger. Interestingly enough, this eagle is more of a scavenger than predator and is often spotted feasting on succulent meaty scraps and carrion. The tawny eagle has a lot in common with our vultures, but wins hands down in the looks department! Not only does the tawny feast on scraps, but it steals food from other raptors. Like most eagles, it does conduct its own hunts and will take down prey of its own – mainly reptiles and small mammals. 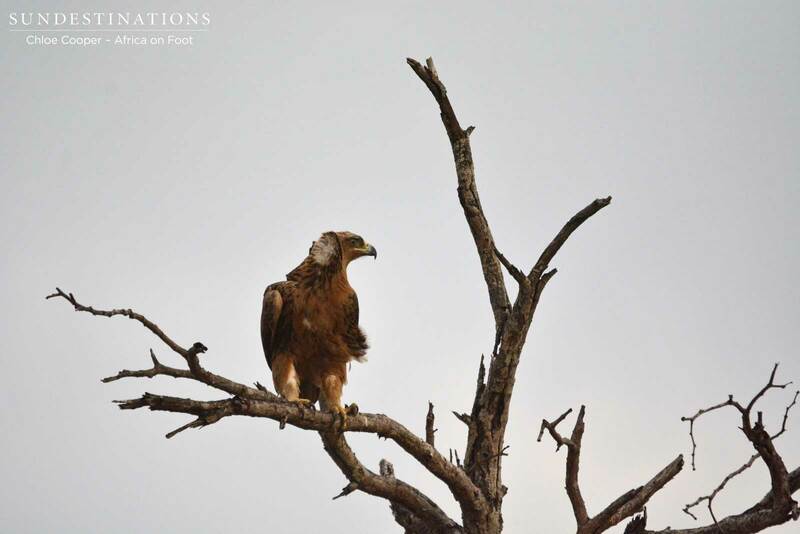 The tawny eagle is easily recognisable by its light brown feathered body and massive talons. Do be aware that there are colour variations – don’t be thrown off if the brown is slightly lighter than usual. Tawnys are useful birds of prey – they lead guides and trackers to lion and leopard kills. The word Bateleur is French in origin and directly translated means “juggler” or “street performer”. When a bateleur is in flight its wings appear to rock back and forth, giving the appearance of someone trying to balance on a tightrope. This pretty bird of prey is one of the most easily identifiable raptors to spot while on safari – they have a bright red beak. The younger bateleurs are more brown in colour, and they’re often mistaken for other birds of prey.